Situated on the beautiful Atlantic Coast in sunny Florida, Fort Lauderdale is visited by more than 10 million people every year. Sometimes referred to as the Venice of America, the city has an intricate system of canals which stretch for more than 165 miles. 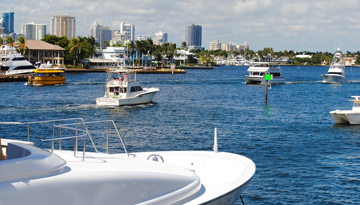 With its tropical rainforest climate, Fort Lauderdale is a hotspot for yachting - there are over 100 marinas to explore containing more than 45,000 yachts. If you're looking for food and fun, there's simply nowhere better, with Fort Lauderdale and the surrounding area having over 4,000 restaurants of all kinds to choose from, and more than 120 nightclubs, so you can dance the night away wherever you want. Aside from the bars, beaches, clubs and restaurants, Fort Lauderdale is host to many fascinating attractions. The Fort Lauderdale Swap Shop is a huge indoor market, which also has the world's biggest drive-in cinema that has 13 screens. The 180 acre Hugh Taylor Birch State Park works its way a long the beach, with picnic and camping areas, and nature trails to explore. Visitors can go canoeing and explore the Terramar Visitor Centre which explains the complex ecosystem of the park. For sports fans, the Lockhart stadium is home to the Fort Lauderdale Strikers, who play in the North American Soccer League. Fly with Air France Oh Lala Deals, flights to Fort Lauderdale from London in return economy at £398. 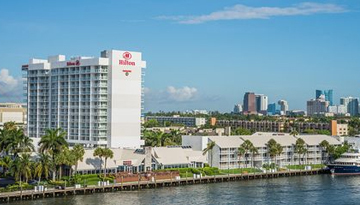 Hilton Fort Lauderdale Marina has plentiful options to book rooms with 4 star stay. 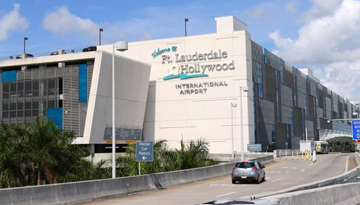 Fly from London Gatwick - Fort Lauderdale & Stay for 7 nights with 3 star accommodation. Room Only.